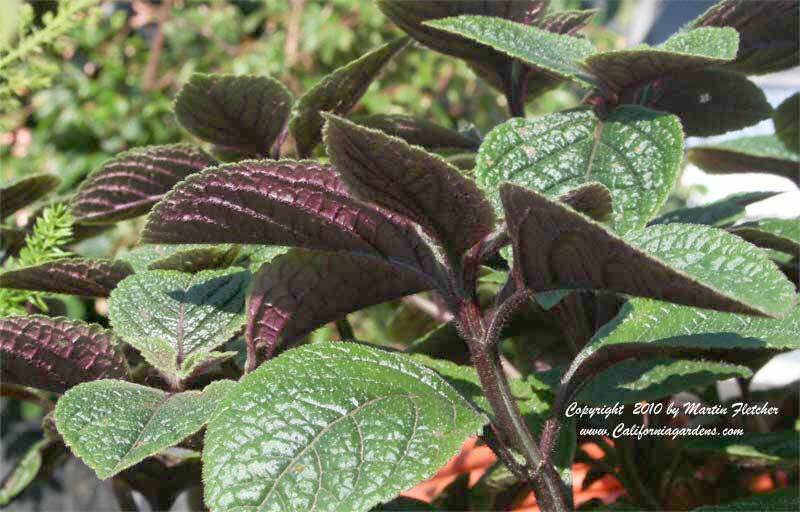 Plectranthus ciliatus Drege is far sturdier than it looks or its tropical African heritage would indicate. Eyelash Spur Flower is low and spreading, typically 18-24" tall and spreading as far as there is water. Plectranthus ciliatus Drege will spread by air layering when the branches touch the ground if there is moisture available, but is quite drought tolerant once established. Plectranthus ciliatus Drege grows best in the shade but will tolerate a partial day of sun near the coast. Plectranthus ciliatus Drege produces pale pink flowers in the late Spring into Summer, I think these detract from the foliage and cut them off when they appear. Plectranthus ciliatus Drege is Winter hardy to the mid 20°s F.
Two tone green and purple leaves of Plectranthus ciliatus Drege - Eyelash Spur Flower. High resolution photos are part of our garden image collection.